21 January – The Department of Environment (DoE) is pleased to announce the completion of a multi-year review, funded by the Darwin Initiative, to determine the contribution of the Cayman Turtle Farm to our wild green turtle nesting population. From 2013 to 2018, DoE researchers spent hundreds of hours patrolling beaches in Grand Cayman at night, tagging nesting female green turtles and collecting small tissue samples for the genetic study. Hundreds of samples were also collected from the turtle farm breeding herd to allow comparison between the farm and the wild population. The genetic results of the study have just been published in the journal Molecular Ecology by the University of Barcelona. They were one of the partners in the project, along with the University of Exeter and the Cayman Turtle Centre. The results of the study show that most of the adult female green turtles that have come back to nest in Grand Cayman have a genetic connection, or a family relationship, to the Turtle Centre. Green turtles in Cayman were once thought to be locally extinct, but this means that the Turtle Centre’s releases in the 1980s and early 1990s, along with sea turtle protection efforts in the wild, have helped re-establish green turtle nesting in the Cayman Islands. It is important to note that genetic study was not an evaluation of the current release programme. The adult female nesting turtles sampled in this study were more than 20 years old and therefore they were released in the 1980s and 1990s. During this time, in the peak of its turtle releases, Cayman Turtle Farm released nearly 30,000 hatching and yearling turtles. This research has shown that turtles released from the Turtle Centre can survive and nest in the wild. This means that the mass releases, led to low numbers of returning adult nesting female green turtles, as we estimate that we have less than 150 green turtles with a genetic connection with the turtle centre in the wild. For any captive breeding and release programme, the potential benefits need to be calculated and risks must be very carefully assessed and continuously monitored. Based on monitoring of our loggerhead populations, we know that protection in the wild is also critically important. 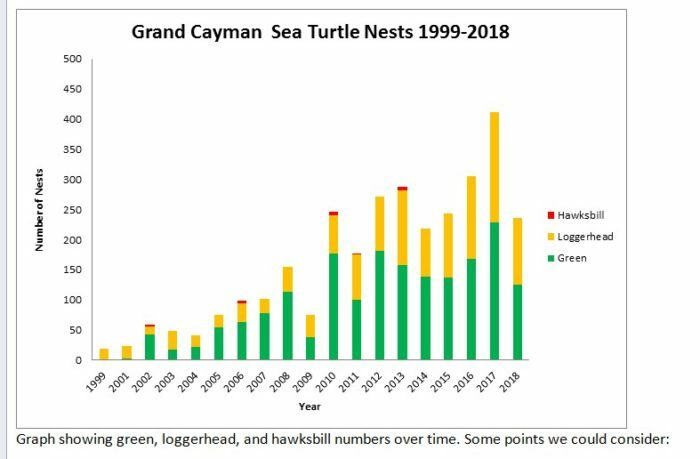 Over the past two decades, protection from hunting and poaching and other factors has resulted in an increase in both green and loggerhead nesting in the Cayman Islands. Loggerhead turtles were never farmed, but their numbers are increasing at approximately the same rate as green turtles. Both species remain endangered, and continuing efforts to control poaching as well as protecting nesting habitat is essential to ensure the future of the nesting population.